We have some very exciting news regarding our newest documentary, Reunion 2010: Life of My Life. The film won the Silver Telly, which is the highest Telly film honor, in the categories of History/Biography films and Charitable/Not-for-profit films! It also won the Bronze award for Education! 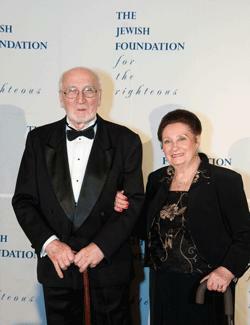 Wladyslaw Misiuna, rescuer, with Sara Marmurek, one of the five Jewish women he saved. Life of My Life documents their story. To purchase Reunion 2010: Life of my Life click here. To read Wladyslaw Misiuna’s story of rescue, click here.